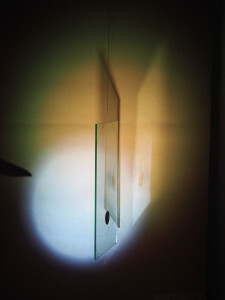 Silent Sounding is a meeting point where Austeen / Magelssen explore simple basic principles related to sound, light and form through joint installation and individual works. The installation is an intervention; a structure of acoustic niches and visual zones. The senses are activated through sound vibrations, fields of color and shape elements. The individual work consists of simple, slightly three-dimensional shapes positioned on the wall. Concrete low frequency audio sources form the basis of a smaller floor installation.